Dr. Hiroko Bissen-Miyajima is Professor and Chief of the OphthalmologyDepartment at Tokyo Dental College, Suidobashi Hospital, Tokyo, Japan.She specializes in cataract and refractive surgery and her reputation as askilled surgeon is well known around the globe. 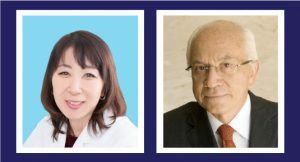 In addition, she is the currentpresident of the Japanese Society of Cataract and Refractive Surgery (JSCRS),and served as president of the International Intraocular Implant Club (IIIC). Besides winning many prominent video and paper awards in the area ofcataract and refractive surgery, Prof. Bissen-Miyajima was the Lim Lectureawardee in 2011, the IIIC Medal awardee in 2013, and ASCRS Honored guestin 2016. Dr. Bissen-Miyajima is a regular reviewer for several ophthalmicjournals. 1. Which exams are the most relevant when planning to correctastigmatism during a lens surgery? The exams of total cornea which include anterior and posterior cornealpower, irregularity, aberration are ideal. However, in most clinics, theanterior corneal power with auto-keratometry, keratometry with IOLmaster or Lenstar are the basic information. In addition, the cornealtopography to find the regularity or irregularity of the cornea would behelpful to plan the lens surgery. 2.How to be successful with toric IOL: five pearls. Patient should be informed that his or her vision could be improvedwith toric IOL. If the patient is not aware of his or her astigmatism,preoperative effort of precise examination to achieve better clinicalresults would be not appreciated. With any type of measurement, the face position should bechecked. As for contact lens user, the contact lens should be takenoff for a while to exclude the influence on the corneal curvature. This is the basic to achieve better vision with non-toric and toricIOLs. To achieve the accurate positioning of IOL axis, confirmingthe steep axis with image guided system is ideal. To avoid thetechnical error of the system, the axis should be confirmed withthe record of preoperative examination. In case with manualmarking, the surgeon should confirm the steep axis with toric IOLcalculation sheet and avoid the misunderstanding of the steep axisdue to the head position under the operating microscope. The most IOL rotation occur within 24 hours after the implantation.Ophthalmic viscosurgical device under the IOL is one of the factorsof early rotation and should be carefully removed before finalizingthe IOL position. 3.What must be avoided during patient selection for multifocal IOL? Giving too much expectation should be avoided. Multifocal IOL is anoption to have better vision at different distances. However, it does notreplace the perfect young-age lens. At our busy clinic, we tend to makethe chair time shorter, but explanation of the characteristics of multifocalIOL is an important key for the success of this IOL. 4.For near vision correction which IOL is the most successful in yourexperience? It is really depending on the patient’s lifestyle. In Japan, most patientsare myopic between -3.0 and -6.0D before the surgery, and had gooduncorrected vision at near. For those who read books, +4.0D nearaddition is preferred, and for those who work with tablet or computer,+3.0D near addition is preferred. Before the trifocal IOL was available,contralateral implantation of bifocal IOL, which means, one eye receives+4.0D near addition and another eye receives lower addition such as+3.0D or +2.5D worked well for those who want good vision for bothreading books and computer work. Now, trifocal IOL is available andshows its advantage. Patient enjoys good uncorrected visual acuity atdistance, intermediate, and near. I believe the trifocal IOL will fit mostpatients who wish to be spectacle free. The current trifocal IOLs fromdifferent companies have trifocal toric type, and this would also expandthe indication for the multifocal IOL. 5.Posterior corneal power: when and how to evaluate? Must be done in allcases? If one has the equipment to measure the total corneal power, oneshould evaluate in all cases before the surgery. However, consideringthe tendency of posterior corneal power depending on the axis of theastigmatism will help even one cannot directly measure the posteriorcorneal power. The reason of under correcting the cylindrical power ineyes of against-the-rule astigmatism was found to be the influence ofposterior astigmatism, and recent toric calculator modifies the correctingpower according to the axis of the astigmatism. I believe that it is not easy to have the expensive equipment to measurethe total cornea and the new calculator would be a great tool withoutmeasuring the total corneal power. 6.Systems as Holos or ORA: are the future or IOL calculation? These would be ideal to confirm the accurate IOL power and cylindricalaxis. I believe that the current approach with Holos or ORA is thebeginning. The influence of lid speculum, ocular surface, intraocularpressure, and IOL position should be further considered.